This Easy Homemade Apple Strudel is the perfect easy homemade pastry treat that's great for breakfast, dessert or a snack! 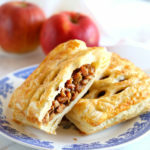 It's so easy to make at home and perfect for apple season! Preheat your oven to 350 degrees Fahrenheit and prepare a large baking sheet by lining it with parchment paper. Add the diced apples to a medium bowl along with the cinnamon, cornstarch and brown sugar and stir well to combine. Cut the two sheets of puff pastry into 4 squares each using a large knife, pastry cutter, or pizza cutter. Cut tiny slits in 4 of the 8 squares you've created, offsetting the slits in rows of 3 and then 4 and then 3 and then 4, etc. This will create the pattern shown in the photos. Spoon the apple filling onto the remaining 4 pastry squares, dividing the filling evenly between them and keeping the mound of filling in the middle of the square. Dampen the edges of each of the squares with a few drops of water, using your finger. Very gently stretch the other 4 squares (the ones you decorated with the slits) over top of the filling-covered squares, pressing down gently around the edges. Whip the egg in a small bowl using a fork and brush the egg over the top and sides of the pastries. Bake at 350 degrees Fahrenheit for about 22-25 minutes or until the crust is golden brown. Let cool for several minutes before enjoying.